Clay Club: Clay Club on Wednesday! April Clay Club will be at Haywood Community College this Wednesday, April 17th from 5-7 pm (note this is a different time and day than our usual schedule). Thanks again to Emily Reason and everyone at Haywood for hosting us! 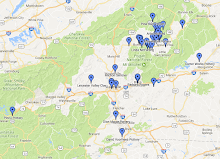 Carpooling: if you're interested in carpooling from the Mitchell/Yancey counties area or from anywhere else, leave a comment on that same blog post or on this facebook post. You can also let me know and I will put folks in touch.